In Newari tradition, during Nawami young girls and boys are worshipped as Ganesh and Kumari. It is believed that young children are pure and God resides in their body. As my parents are here this year, we did the ritual this morning. We had Chhori as Kumari and my nephew as Ganesh. 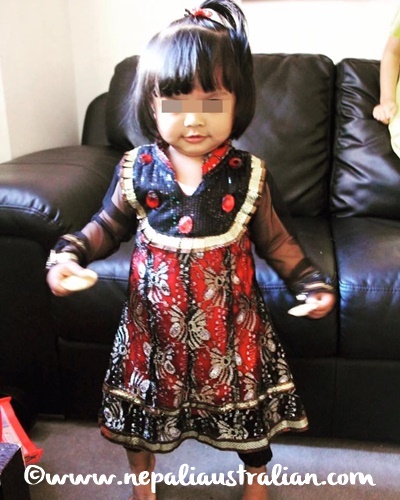 To celebrate Dashain, I dressed Chhori in traditional Nepali kurta. I absolutely love traditional outfits on Chhori, she looks so cute. We did the simple process for puja; just tika and flower first, then all the adults gave them gifts or money and touched their feet for blessing. Both the kids were over joyed getting all the money and gifts. It feels so good to do traditional things for Dahain. Made me miss Nepal a little less this year. Hope everyone who is celebrating Dashain is having a great time. 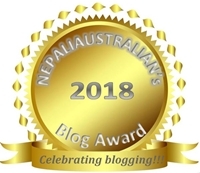 This entry was posted in Australia, Nepal, Nepali Culture, Nepali Festivals, Newari Culture and tagged Australia, Bada Dasain, Bada Dashain, car pooja, cars, Changa Chet, culture, Dashain, Dashain 2012, Dashami, Dashera, Durga, durga saptashati, Flying Kites, Fulpati, Ganesh Puja, Ghatasthapana, goddess durga, Guthi australia, Happy Dashain, hard-shelled coconut, hindu festival, home, how to perform car puja, How to plant Jamara, jamara, Kites, Kuchi bhwey, kumari puja, Maha Asthami, Maha Nawami, Maha-Navami, Nawami, nawami puja, Nepal, nepali australian, nepali food, Nepaliaustralian, Ping, Puja, Purnima, Ram Chandra, religion, sacred hymns, special weapons, spirituality, sydney dashain, Vijaya Dashami, Vishwakarma. Bookmark the permalink. 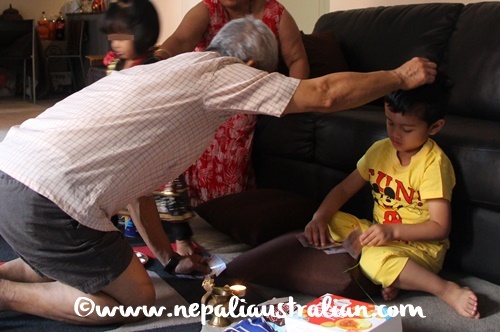 Happy Dashain to you, Australian. I bet the kids were thrilled, all that money and the presents. I was just remembering my childhood and Christmas. I’m glad you had a good time, Australian. It must feel so good having Mum & Dad there this year. Wow! Chori is so BIG now! Great to see you all doing well! Thank you and same to you and your family.